Soon a Treo 650 Cobalt? I don't know about you but I feel that in recent months there's been a palpable increased buzz and momentum building around all things relating to our Treo (or perhaps it's just me getting overly zealous). 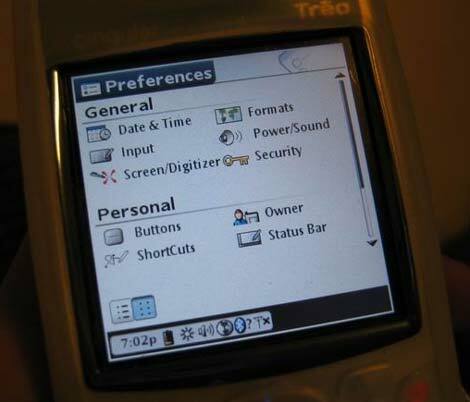 The latest comes in the form of a screenshot of PalmOS Cobalt running on our Treo. Whether this is indeed a real palmOne test model or the work of an enterprising hacker who was looking for a minute of fun is impossible to say but at least we have something to look forward to - the day when we have an even better PalmOS on our Treo. It's a fake. Someone took a 320x320 screenshot of a Cobalt emulator and plugged it into a picture viewer of some sort. Someone did a similar trick a few months ago with the Archos Gmini 400 to make it look like it was running a Sega emulator. The Treo 650 isn't getting Cobalt any time soon, people. If anything, palmOne will save Cobalt for the next Treo -- and maybe not even then. Garnet was supposed to be the smartphone OS, right? It's a fake. Come on, "Shortcuts" in the Preferences of a Treo? There's not even Graffiti on it. u can still use the pre-defined shortcuts on the 650. I double checked it and haven't seen this in the prefs of my own 650. I still believe it's a fake although I'd love to see Cobalt on the Treo 650.